Anne Diamond spoke with Jason Ball live on BBC Radio Berkshire yesterday about Barn Owls. Anne was following up the national news story about owls being dependent on nestboxes. Jason pointed out that actually it’s a sign of success, and reason to congratulate the nation’s Barn Owl conservation volunteers, and the farmers they work with. The headlines were sparked by a BBC news interview with Colin Shawyer, who founded the BOCN (Barn Owl Conservation Network). The Sheepdrove Trust sponsors the BOCN and Sheepdrove is its national HQ. Colin, who trained Jason in monitoring and ringing owls, carried out a study in the 1980s which revealed a massive decline in the Barn Owl population. So he set up the BOCN and it soon became a key network for advisors and owl conservationists across the UK and Eire. “In some areas, such as Salisbury Plain, nest box schemes have increased the barn owl population by up to five times. But the reliance on nest boxes is now so great, the birds will need constant conservation,” explained Colin. Lambourn Valley Barn Owl Group has been very busy building nest boxes here at Sheepdrove, to sell as a way to raise money for the group. Of course those boxes must go into areas with good owl habitat, otherwise they won’t help owls at all. So LVBOG also provides advice to farmers and landowners about how to manage grass for the prey that owls rely on. An event for the Friends of the Ridgeway at Letcombe Bassett village hall. Jason Ball will give a presentation about wildlife at the farm, and then one about owls – featuring the work of the Lambourn Valley Barn Owl Group. A charge of £3 will be made for non-members. Annual Membership of the Friends of the Ridgeway is £5. 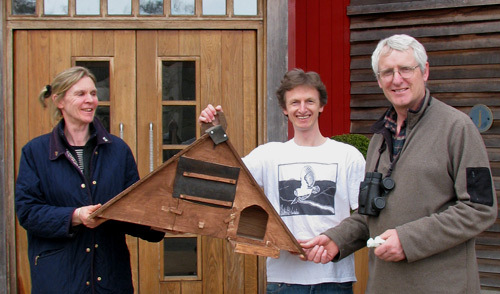 The Lambourn Valley Barn Owl Group and volunteers at Sheepdrove Organic Farm have been developing my prototype for a small Barn Owl nestbox this spring. We installed our first of the new models at Bockhampton Down, to replace an old polebox. The more good sites you have, the better. Alternative box sites are important, e.g. for 2nd broods; owlets seeking their own home; during winter when owls might stop defending the favourite breeding site; or when competition for boxes is high. Heavy and bulky boxes are difficult to install. Lightweight boxing is easier! This triangular box has the naturally rain-shedding shape of the larger A-frame designs promoted by Colin Shawyer and Sue Dewar, Iain Taylor, and of course the Hawk and Owl Trust. 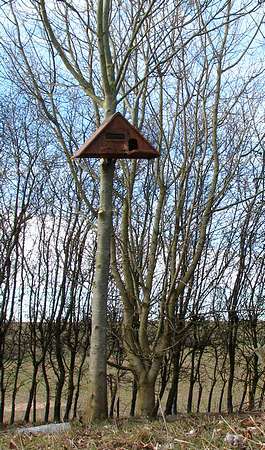 Key factors considered for this box design are the weather, competitors such as Jackdaw, and the behavioural needs of Barn Owl – especially at breeding time. With a low extrance, it’s vital to have a baffle to keep chicks inside until they are agile and able to climb. When owlets are ready to begin wing exercises, they are also eager to explore perches, getting out and about. They also want to be first in line for food deliveries! The baffle encloses a ‘main chamber’ which is large enough to fit a family of young owlets. Although it would not be roomy to a large family of fully-grown owlets, after about 5 or 6 weeks of age the eldest will be able to spread out into the hallway. From general trends of vole populations, 2009 was predicted to be a poor year for Tyto alba. However, signs are not too bad in the Lambourn Valley, even after that harsh February snow. Nest site monitoring began this month. By this time egg-laying females are very likely to have completed clutches, and with luck most owlets are hatched. But the Barn Owl is so flexibly responsive to prey availability, that each pair might be at quite different stages of breeding. All sorts of animals like a cosy cavity for a home! There are more sites to check, and we hope to discover more owlets. In spring we installed boxes at a number of farm locations, providing more owl homes in the Lambourn Valley. Thanks to local landowners and donors for making this possible. If you would like to donate towards our work, please send a cheque payable to Lambourn Valley Barn Owl Group, and post to the group via Sheepdrove Organic Farm, Sheepdrove Road, Lambourn, RG17 7UU. Thank you. LVBOG volunteers operate under the auspices of Pang, Kennet and Lambourn Valleys Countryside Project; monitoring is under their Schedule 1 licence. Jason Ball is a licensed BTO ringer for Barn Owl.